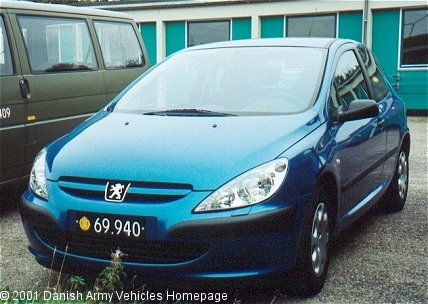 Danish Army Specific: Bought autumn 2001 the Peugeot 307 probably supersedes the Opel Astra. The 307 is used at the Garrisons motorpools, at army schools etc. Historical: The 307, which was designed by Pininfarina, was launched in Europe during March 2001 as the successor for the 306 model.. The 307 became "Car of the Year" in Europe in 2002. A 307 CC 2.0 was launched in June 2003. Length: 4.20 m (164 inches). Width: 1.75 m (68 inches). Weight: 1.750 kg (3.850 lb). Engine: Own 4-cylinder, 1.997 cm3 (122 cubic inches) displacement, common-rail, liquid cooled. Horsepower: 90 at 4.000 rpm. Additional: Equipment includes dual (smart) frontal airbags, side airbags (thorax) , head protection airbag (curtain), front belt pre-tensioners and load limiters, three-point centre rear belt, ABS, servo assisted steering, brake assist emergency braking and auto warning. ESP is optional. Max. speed is 179 km/h.